Home » The ASH Group are supporting the Offside Trust – Get Your Tickets Now! 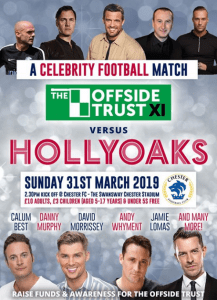 The ASH Group are delighted to support the upcoming charity match at Chester FC’s Swansway Stadium on the 31st March 2019. The charity match, which will raise funds and awareness for the Offside Trust, will feature ex professionals such as Steve Walters (Crewe Alexandra) Danny Murphy (Crewe, Liverpool, Tottenham, Fulham & England) Trevor Sinclair (QPR, Man City, England) and celebrities such as David Morrisey, Andy Whyment, Gary Lucy and Jamie Lomas. The Offside Trust XI will be managed by current Chester FC Joint Managers Anthony Johnson and Bernard Morley. Please support this amazing cause if you are able to!